When fiction and non-fiction come together in perfect harmony, something magical happens. And this statement definitely applies to The Day We Built the Bridge by Samantha Tidy and Fiona Burrows. This is a brilliant and engaging picture book about the construction of the Sydney Harbour Bridge. From the bridge’s inception in the 1890s to the day the bridge was completed in 1932, the story follows a boy and a city as an idea forms, planning starts, war comes, everything stops, war ends, construction begins, years pass and a bridge is finally built. The boy and the city grow through the years, and the world, too, changes around them, impacting on construction. But the need and passion for the bridge never falters and a spectacular dream is realised. With poignant and pared back text, much of the story is told through the beautiful illustrations that are filled to the brim with the most amazing details of the time. They are stunning, and on every page they create opportunity to talk about important and interesting topics with your audience. This is definitely a book to take your time with. There is so much to look at, so much to discuss. And at the heart of it is a true story about a grand vision for a city and what it took to see it turned into reality. Schools and classrooms will love this story. It’s entertaining and interesting, and will teach kids about a remarkable period in Australian history. 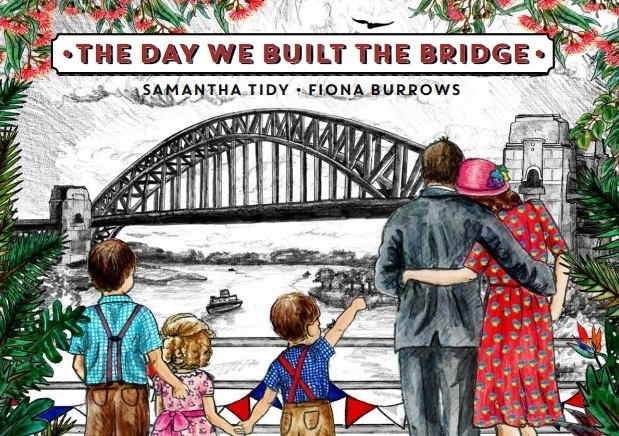 Beautifully written and illustrated, this is a special picture book about a very special bridge.